I finally started making a hat to match the Baby Surprise sweater I made for my nephew this summer. 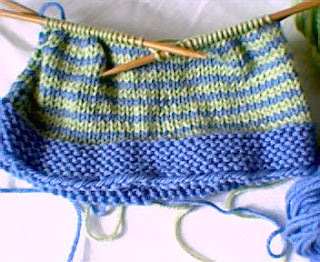 It's coming along nicely and should be done soon, in spite of my limited knitting time these days. I've decided against making a set of matching bootees. By the time my nephew is big enough to wear the sweater, he'll be big enough to be able to kick bootees off, so making a set would be pointless. Now all I need to do is find some cool buttons for the sweater. Unfortunately, my favorite place to find buttons in Chicago, Tender Buttons, has been closed to make way for yet another unnecessary Gold Coast condo tower. Just who is buying all these condos anyway? It's out of control. So I guess I'll have to see what I can find at Vogue Fabrics on Roosevelt Road. Or maybe I'll see what I can find online. If anyone knows of a reliable source for good buttons, please let me know.